The pendant features an oval-shaped sapphire cabochon measuring 18.27 x 13.01 x 7.52 mm and weighing approximately 20.00 carats, enhanced by European-cut diamonds weighing a total of approximately 4.00 carats, set in 22k gold. Gross weight 13.20 grams. Condition Notes: A luxurious adornment. Clasp marked 22K. A few of the diamonds fall into the SI clarity range. Clasp is slightly misshapen. Minor chips to the girdle of the diamonds. The sapphire has moderate nicks and chips, as well as surface reaching inclusions. 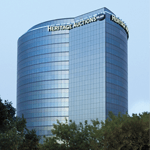 ** Lots bearing estimates and without Consignor Reserve shall open at Heritage Auctions' discretion (usually 25% to 60% of the low estimate). (Lots 55001-55317) - 10:00 AM Central Time, Monday, April 29, 2019.